Report this species if seen on Kauai! Jackson’s chameleons are a popular pet that can escape the cage and establish feral populations in Hawaiʻi. They are bright emerald green fading to a yellowish color on their undersides. Males are generally 10-12” long with a long, prehensile tail accounting for half of their length, and with three horns protruding from their forehead. Females are generally a little shorter and never grow horns. 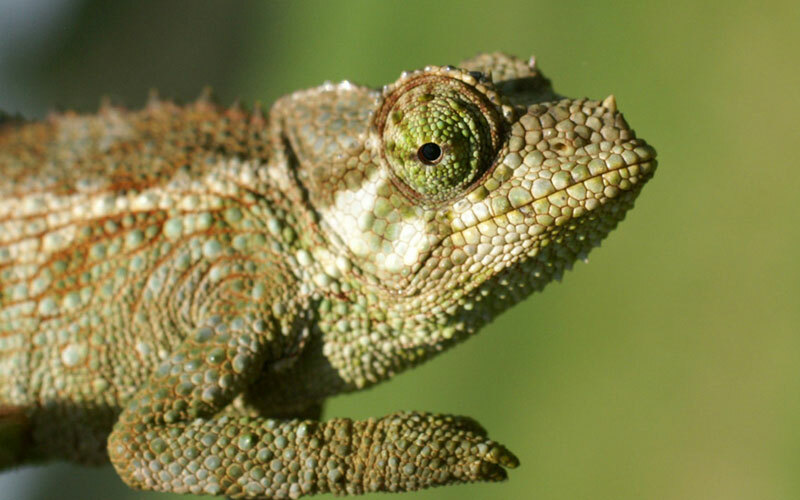 Jackson’s chameleons are solitary creatures which spend most of their time in trees. 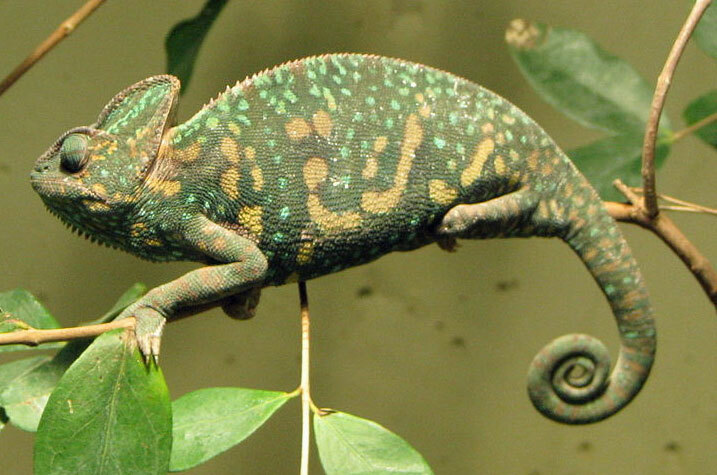 Chameleons move with a distinctive slow rocking motion. Chameleons’ ability to thrive in a variety of forest environments where they are yet another predator of Hawaiʻi’s native insects, spiders, and snails, making them a less welcome guest in Hawaiʻi. 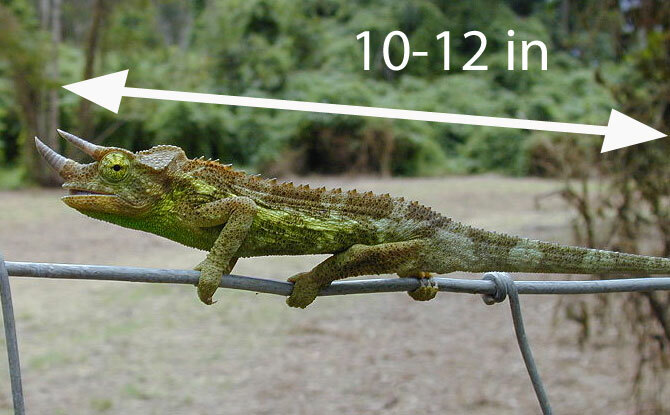 Chameleons are also a potential prey base for the brown tree snake and other snakes, which increases the likelihood of this alien species establishing populations if ever introduced. Introduced from Kenya and Tanzania to Hawaiʻi in 1972, this popular pet was inte ntionally released in Kāneʻohe and now has established free ranging populations on the islands of Hawaiʻi, Maui, and Oʻahu. 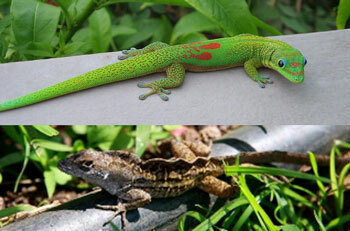 They have not become established on Kauaʻi- report any sightings on Kauaʻi! 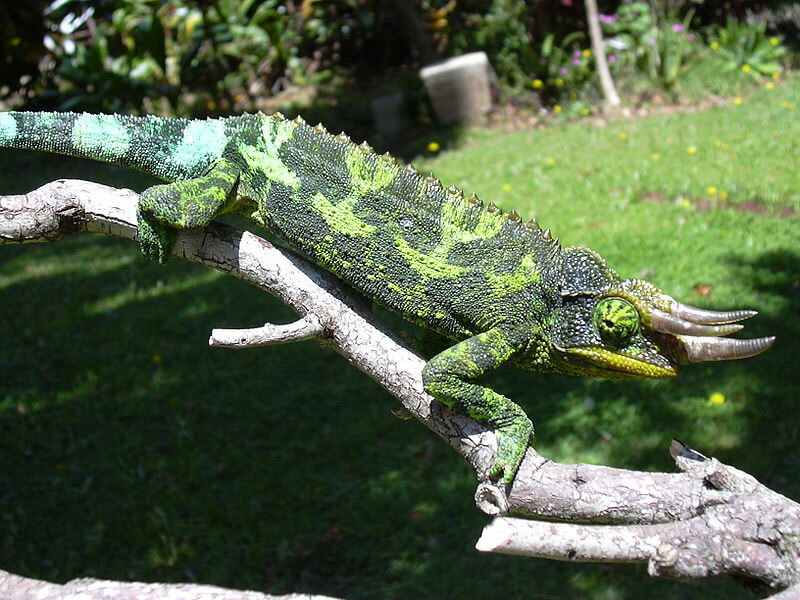 Veiled chameleon (Chamaeleo calyptratus): This species is typically larger than a Jackson chameleon. They also have a large casque (sharkfin-like shield) on their head, as compared to the three horns of a male jackson. THIS SPECIES IS ALSO A PEST!